The laptop has been sick. That’s why this channel of communications has been quiescent. The laptop is better but not cured so this will be a short catch up! Staithes and Whitby Sheds seem to be in a perpetual state of makeover, but the ends are in sight. The enquiries about the Sheds have been on the up too. 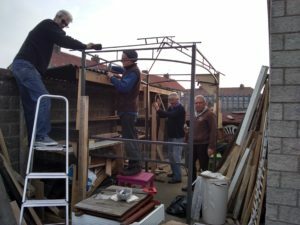 The Brothers Grim, Tony and Ray, in process of building a prizewinning workbench at Whitby. Margaret in Liverton Mines has donated some great stuff. 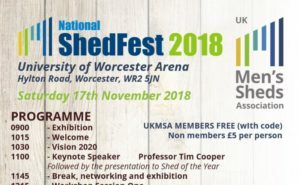 Shedfest 2018 by UK Men’s Shed Association is on the cards for a week’s time in Worcester. Graham is he discovers on the welcome desk. Talk about a square peg in a round hole. On the Friday evening the Ambassadors are getting together for a look into the UK Sheds future vision. Well, there is new vision in Whitby too, as a tracks are made into the area of much reported concern over children and young people and the lack of face to face friends and places to make friendships. Isolation in the young. 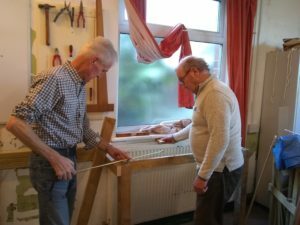 Based on the two successful projects with Eskdale School and Eskmouth Scouts (facilitated by VIY), the School, Scouts and SAMS were pointed by Two Ridings Community Foundation to a funding scheme to stimulate and develop young people through combined action. We applied jointly in the name of SAMS and learnt just two weeks ago that we successful. The project is a pilot and plans to have a younger stream (8-11) and an older stream (12-15). It was described in an Opinion piece in the Gazette about a month ago. It will engage young people across the Whitby area and across the year. The working title is Making Good but, like much else, the project will be geared and steered towards young peoples ideas, and that includes the title. Expect it to change:-). 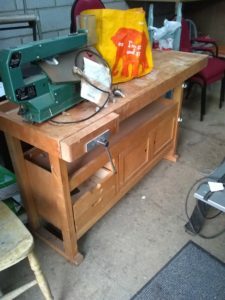 There will be workshops but not only DIY. Much broader and the activities will likely take place in different places and settings. Read more in Friday 23rd’ Novembers Gazette. AND there is a bonus package.being prepared independently through North Yorkshire Youth. They have just come forward with a proposal that SAMS is helping develop with for a Youth Shed(s). The intention is that such activity is weekly in early evening and in localities. 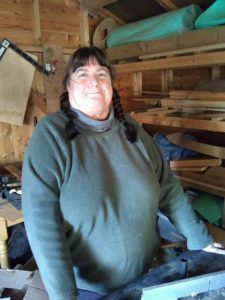 We are hoping for a Sleights Youth Shed using the Scout Hut which is a wonderful “secret” hideaway! In all this there will need to be manageable involvement in various ways by individuals, interest groups of all kinds and even by businesses. It is to benefit our young people in Whitby district and to support their Can Do Together spirit.